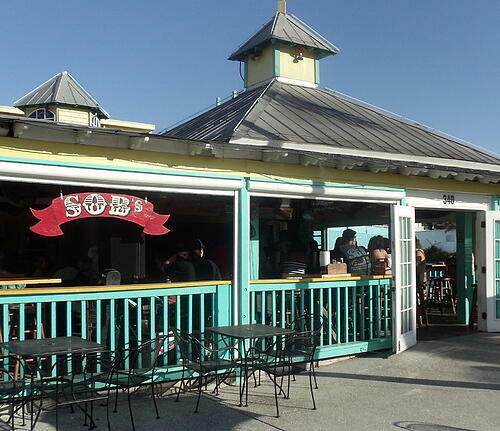 Locals refer to Smokin’ Oyster Brewery as SOB. Branded as the “classiest dive on Fort Myers Beach,” it’s one of the few restaurants nearby to hear live, outdoor music seven days a week. Bands play on the porch of their renovated Florida home while guests enjoy the lively atmosphere over delicious island favorites, prepared fresh daily. Let’s not forget that it’s called an oyster brewery for a reason. Smokin’s “Rock-a-fella” platter features just-shucked oysters with spinach, bacon and mozzarella and is just one of their oyster selections. Many also love their Combo Bucket, packed with oysters, shrimp, clams, mussels, corn, potatoes and crab. Wash it down with some ice cold beer, or a creative cocktail like their SOB Tea with sweet tea vodka, lemonade and club soda— and enjoy the sunshine.